Wealthy Tudors are immediately recognised by their fabulous clothes. Fashion was important to the Tudors for both the men and the women. This section covers the clothes and fashion in Tudor times and the fabrics used to make clothes for the Tudors. What were the rich Tudors clothes like? What were the poor Tudors clothes like? What did the Tudors wear for their wedding clothes? This comprehensive section provides the History, Facts and Information about the Tudors Clothing and Fashion covers all aspects of Renaissance clothes and Fashion including Hair styles, Make-up and Jewelry. Why were the Tudor clothes and fashion different for Royalty and Nobles as opposed to the poor Tudors? 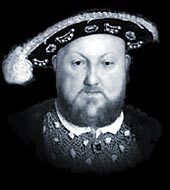 King Henry VIII enacted Sumptuary Laws or Statutes of Apparel which were designed to to keep the different classes separate. The clothes of the Tudors were regulated by law. It did not matter how wealthy you were - clothes and fashion indicated status and violation of these laws could result in loss of property, title or (in cases of lower class Tudors) even death. The Costumes worn by the rich Tudors were fabulous - sumptuous materials, vivid colors and extremely costly. Read about ideas for Costumes from the times of the Tudors with a comprehensive list of underclothes and outer garments worn by the Tudors. The codpiece became prominent during the reign of King Henry VIII who is often associated with the codpiece and this peculiar, over sized, item of clothes and fashion is featured in his portraits. The dress or gowns were made up of a collection of different and separate items in the tudors clothes and fashion. The Tudor dress consisted of an overskirt which was split in the middle in a 'v-shape' to reveal the front panel of the kirtle. Royalty and the the Nobility, wore make-up as an indication of their status and rank. Make-up also had a practical use to hide the scarring of various diseases such as smallpox. Interesting Facts and information about Tudor Underwear / Underclothes together with a List, Definition and Description of all Underwear and under clothes for women and men. The Ruff started as a high frilled collar in the fashion of the Middle Ages. The ruff became bigger and more exaggerated and was constructed on gauze wings which were raised at the back of the heads of women. The doublet was a fashionable tight-fitting buttoned jacket that was worn during medieval and Tudor times. The doublet had a wide variety of styles including the heavily padded, Peascod doublet. Short, skirt-like, additions were added, called the Peplum doublet which covered the waist of the hose or breeches, the height of fashion. Definition and description of all types of Tudor jewelry including the Jewels and Precious Stones used to make Tudor Jewelry such as gold, silver, Diamonds, Emeralds, Sapphires, Rubies, Topaz, Opals and Pearls. The introduction of Italian and French fashion exhibited better taste and a greater amount of elegance in the clothes of royalty and the nobility. The typical Tudor clothes and fashion for a King such as King Henry VIII are featured in this section. Whether a man or woman was rich or poor they were not allowed to wear whatever clothes they liked due to the Tudor Sumptuary or Statutes of Apparel. The higher the rank and class the more choice of clothes, materials, styles and colors that could be worn. The clothes for rich or poor Tudors would immediately indicate their status and rank. The clothes and fashion worn by the rich Tudors were fabulous with sumptuous materials, vivid colors and extremely costly. The fashion of slashing material & fabrics is explained in this clothing section. Each section of this Tudors website addresses all topics and provides interesting facts and information about Tudor Clothes and fashion. The Sitemap provides full details of all of the information and facts provided about the fascinating subject of the Tudors.